Armadillo Aerospace's Pixel lunar lander entry hovers above its launch pad during a test. GOLDEN,Colorado - What goes up, must come down—but tenderly and precisely. That?spart of the rules for the Northrop Grumman Lunar Lander Challenge. TheChallenge is a major head-turning event at the upcoming Holloman Air &Space Expo in Alamogordo, New Mexico. The countdown clock is ticking as the Oct.27-28 expo draws closer, staged in collaboration with the WireflyX Prize Cup. At thisyear?s Cup, the Northrop Grumman LunarLander Challenge will see rocketeers vying for $2 million in prizes thatare on the line - cash made available through NASA?s Centennial ChallengesProgram. That space agency funding is focused on speeding up commercialdevelopment of technology that can ferry cargo and humans between the moon?ssurface and lunar orbit. Level 1 requires a rocket to take off from a designated launch area, rocket up to 150 feet (50 meters) altitude, and then hover for 90 seconds while landing precisely on a landing pad nearly 330 feet (100 meters) away. The flight must then be repeated in reverse - and both flights, along with all of the necessary preparation for each, must take place within a two and a half hour period. Level 2 requires the rocket to hover for twice as long before landing precisely on a simulated lunar surface, packed with craters and boulders to mimic actual lunar terrain. The hover times are calculated so that the Level 2 mission closely simulates the power needed to perform a real lunar mission. 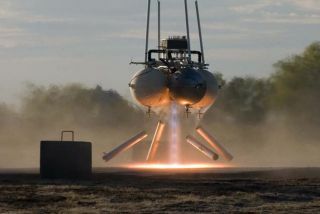 AcuityTechnologies of Menlo Park, California; ArmadilloAerospace of Mesquite, Texas; BonNova of Tarzana, California; Masten SpaceSystems based in Mojave, California; Micro-Space of Denver, Colorado; ParagonLabs of Denver, Colorado; SpeedUp of Laramie and Chugwater, Wyoming; andUnreasonable Rocket based in Solana Beach, California. That?seight individual teams, with a ninth ?mystery team? withdrawing rather thanhaving their identity publicly revealed. ?At thispoint, it looks like there are two teams that still have a chance to fly?Acuityand Armadillo,? said Will Pomerantz, director of Space Projects for the X PrizeFoundation. ?Both have work to do between now and the Cup and, as is the natureof such a competition, new issues are continually arising for all parties,? hetold SPACE.com. Pomerantzadded that all those involved in the Challenge are getting quite good atquickly solving problems as they crop up, be they from Holloman Air Force Base,the Federal Aviation Administration?s Office of Commercial SpaceTransportation, as well as X Prize Cup officials. Armadillostill hopes to bring their two different vehicles, Pixel in Level Two, and ?theMOD? in Level One. Acuity is building two substantially similar vehicles,called ?Tiger? and ?Cardinal?. A Pomerantzprognostication: ?We?re confident that one of these teams will win at least oneof the prizes this year!? Almost allof the teams that are part of the competition—even though a majority of themare not going to actually fly their craft—should show up in one fashion oranother, Pomerantz said, proudly displaying their varying vehicles. AcuityTechnologies is led by Robert Clark, who founded the company in 1992. The team,which has previously designed unpiloted aerial vehicles for the Department ofDefense, hopes that the lightweightcraft they have concocted will give them an advantage in the Challenge. ArmadilloAerospace is powered by John Carmack, founder of id Software. They are theonly team to fly a vehicle in last year?s Challenge, arguably giving them alunar leg up on the rocket rivalry. Additionally, they have backed that view byrepeat flights throughout the year of hardware to shake out control proceduresand the technology itself. And whilelunar vehicles are being prepped by their respective teams, pads for thecompetition are being installed at Holloman. All five pads for this year?scontest were generously donated by Mesa Verde Enterprises, Inc. of Alamogordo,New Mexico, Pomerantz noted. ?They took a lot pride in the lunar surface?whichlooks fantastic.? Six judges—with more than 200 years of space experience between them—will overseethe competition, deciding a winner of the competition and other elements of the$2 million prize. The judgesare: Ed Bock, retiree and consultant to Lockheed Martin; Richard C. Dunne,consultant to Northrop Grumman Corporation; Bill Gaubatz, former head of theDelta Clipper Experimental (DC-X) reusable rocket program; John Herrington,Vice President of Rocketplane and former shuttle astronaut; S. Pete Worden, CenterDirector for NASA?s Ames Research Center; and Jeff Zweber of the Air ForceResearch Lab?s Space Vehicles Directorate. As chiefjudge, Gaubatz underscored the fact the Northrop Grumman Lunar Lander Challengeis a key element of a great contest, ?the race to open space for business andpleasure, as well as to sustain a long term science and exploration thrust thatwill expand the universe in which we live, work, and play.? Gaubatzfeels that those involved in the competition are part of the worldwide band ofentrepreneurs and innovators ?that are validating the efficacy of the newprivate space sector to design, build, and operate safe, reliable, and costeffective systems that can open and sustain space based commerce.? Theevolution of commercial space operations, he added, will one day soon allowNASA to exploit that capability for carrying-out operations for the spaceagency?s space science and exploration programs. ?It hasbeen an excellent competition. In fact, perhaps it has been the bestcompetition that we?ve run ? in terms of having a very high-percentage of theteams doing substantive work,? Pomerantz suggested. Althougheach of the teams took on the Northrop Grumman Lunar Lander Challengedifferently, was there a common thread between the groups? ?In talkingwith these eight teams, it?s clear that they are all absolutely thrilled aboutwhat they are doing ? spending all night, every night and all weekend, everyweekend working on this,? Pomerantz said. ?These people eat, sleep and dreamthis stuff. Their love for their projects absolutely shows and is certainlyreflected in their work. ?